Men often admit they’re unsure what supporting gender equality looks like—and they may not want to ask. They wonder which behaviors should be emphasized or avoided. They wonder what they should and should not do in the #metoo era; for example, could their attempts to support women at work be misinterpreted? And they wonder how to be champions without trying to present themselves as knights in shining armor. Of course, the answers are complex. In this section, we provide articles and links that highlight specific behaviors that illustrate what it means to support gender equity. Gender-supportive behaviors encompass the many different roles that men play in their lives: as leaders and managers, as colleagues and peers, as husbands and fathers. There are many ways for men to be supportive at work that don’t require shouting “Sexism!” at their next meeting. Forté CEO Elissa Sangster shared some tips with Forbes. This New York Times article highlights the steps individuals and companies can take to reduce sexual harassment in the workplace. In a LinkedIn post, a white male executive shares his strategies for supporting his women colleagues. 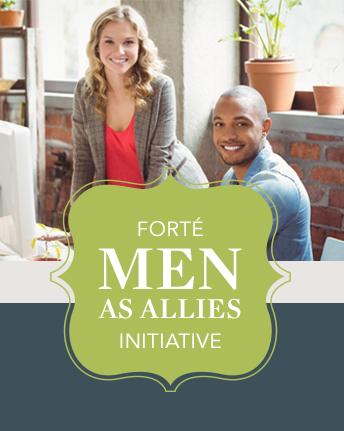 Lean In developed tips for men to support gender equity both at work and home. The highlights are in the sidebar, or visit the URLs to read the full descriptions.